Pakoras ... and Onion Rings with an Asian twist! Now let's make some pakoras and ... onion rings with a South Asian twist! a brown paper bag is a nice extra (to help reduce the oil on your plate). 1 1/2 Cup gram pulse flour (may be found at South Asian grocers or selected retailers featuring a section of sub-continental groceries [ie, Indian and Pakistani].) also known as chickpea flour, garbanzo flour or besan. In a mixing bowl (sufficiently large to contain and work with all ingredients), combine all dry ingredients stirring with a whip until all elements are blended (a fork will take longer than a whip to accomplish this goal). Add water, starting with 3/4 cup and thinning just a little at a time until it behaves like a smooth ... slightly thickish cream of wheat (as the accompanying, little video clip). The dipped pieces may drip, a little, even when properly coated. Drop coated pieces from a fork or tongs or other device for handling the raw pakoras. 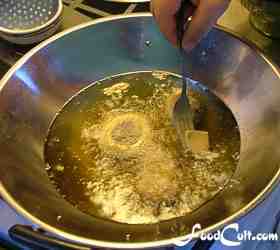 Deep fry at a medium-low heat (2 1/2 on a scale of 1-9 on a gas stove) only enough for the pakora batter to turn a tan color as it swells, a little, around the vegetable pieces turn, using the slotted spoon or tongs, occasionally to monitor color and assure even cooking. Let a pakora drain and cool a little (so you don't scald your mouth) and see if it is cooked to your taste. 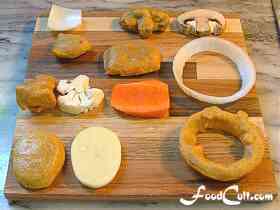 Notes: If your pakora/rings seem a bit tough or chewy try cooking them less (lighten the shade a little). If the vegetable isn't cooked - darken it a shade. If your batter is chewy (tough from over-cooking) lower the temperature a little. Good pakora takes a little practice. Try again and adjust the spices to your liking. "Indians love them too much!" Our relatively new English speaker complained as he prepared the little vegan snacks - pakora for a party. On the occasions where he made them just for us they weren't the mixed pakoras that are traditional as those he was making that day ... the kind they make in most sub-continental restaurants. Rather, it was a single-vegetable pakora. He would dip a slice of potato, or a hot finger pepper or a slice of carrot ... and even a piece of onion - peeled from a whole onion cut into eighths - dipped in batter and deep fried to perfection - the batter pale golden, the onion still has a little of its natural snap ... but not biting! The hot finger pepper would still have its flavour but most of the heat (though not all) would be cooked out in the process of deep frying. 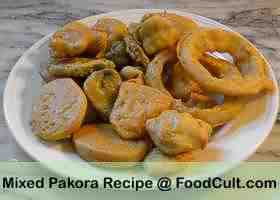 Indians would even make okra (gumbo or, as Indians called them, "lady fingers" or "bindi")-pakora. Upon return from India we knew that mushroom pakora would be awesome! Still, we don't have them too often. They are, after all, deep fried. Lately, though, we'd been day-dreaming about onion rings. Since we don't go to burger joints (we prefer to have burgers at home) we decided to make the interesting "onion ring" choice - to use the beautiful and exciting flavours of South Asia with these not-so-traditional battered onion rings. While Indians at home will dip their pakoras into any number of sauces, including a spicy tomato ketchup or a sweet mint ... or even into a tangy/sweet tamarind sauce, we find the flavour of the batter to be sufficiently exciting that we don't dip certain flavours like the onion ring. We like those delightful rings, best, plain. There's enough flavour in the batter that they don't need (or want) extra salting ... and, of course a nice flavour emanating from the onion itself. We have used common yellow and Spanish onions for these. So far, "Spanish" onion rules. Red may have, too, its own delightful flavour and certainly deserves trying. You'll learn, over time, which vegetables you like best in your pakora. As you go forward, you will decide how much spice you like in your batter. We suggest erring on the side of caution, particularly with the cayenne. The amount recommended in this recipe may be considered "very spicy/hot" for some (although we use just a little more than shown here). Ketchup lovers should know, however, that plain ketchup (or catsup ... or however you write and/or say it) is a pretty tasty pakora dip too! When we make this particular treat we deep fry in a wok although we do recommend a deep frier as a considerably safer alternative.